Vicki Doudera here, happy to have successfully completed the challenge of National Novel Writing Month (NaNoWriMo) in November! Yay! I know you’re probably sick to death of hearing about this, but this will be the last time I mention it (for a while, anyway…) Feels good to have that under my belt, especially given that this weekend is a big one in my town — our 27th annual Christmas by the Sea Celebration – and I’m ready to relax and get in the holiday spirit. Now – it would be a crime if you skipped this event, taking place Friday, Saturday,, and Sunday, or if you showed up, but missed the real highlights! So here are some tips on things to do from your girl in the know for a fun, festive weekend. Best of all… many, if not all, of these activities are free. Literally… don’t miss it… because if you are not on Main Street in Camden at 6 pm on Friday, December 6th, you very well could! The brainchild of Camden and Rockport’s Cub Scout Pack 200, the parade has grown from one float (me and lots of cub scouts and a few Dads throwing candy) to a larger, brighter affair. But while the parade has grown tremendously over the past few decades, it’s not quite the size of Macy’s. So if you dip inside a store, be sure to keep an eye on the time. 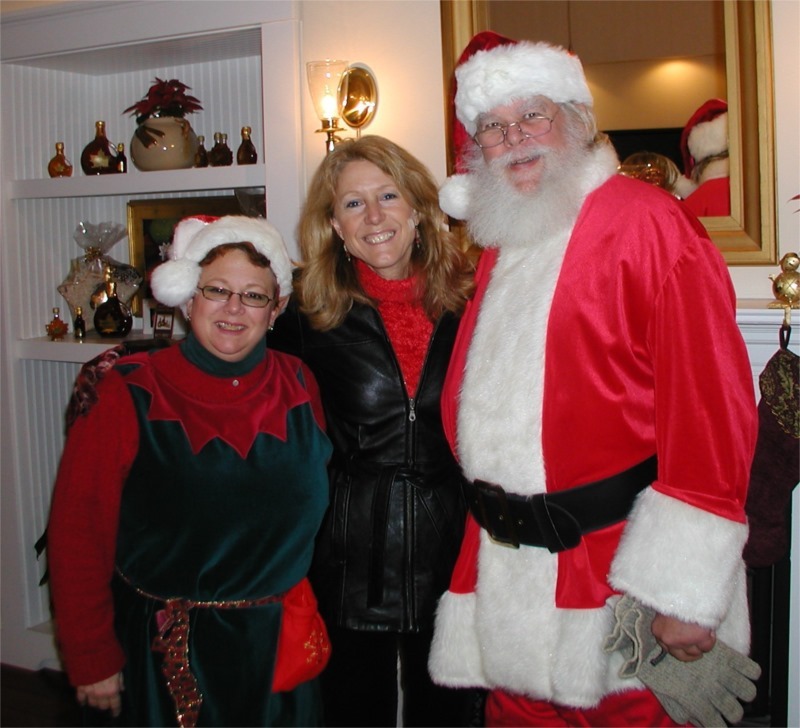 Holiday fairs abound on Saturday, from one at the First Congregational Church of Camden (9 to 2) featuring local artisans and their work, to the Holly Berry Fair in Rockport’s Opera House, hosted by the Rockport Garden Club (8 to 1.) These fairs are fun to browse and are great places to find unusual gifts. Saturday at 6 pm, Camden’s harbor will light up with a pyrotechnic display. Be sure to have reserved space for dinner afterward as the town can be very busy. 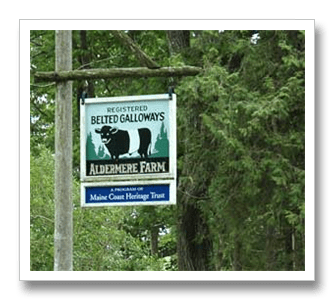 Many more activities are listed at the Penobscot Bay Chamber’s website or on this guide. Have a wonderful weekend and look for me out and about! 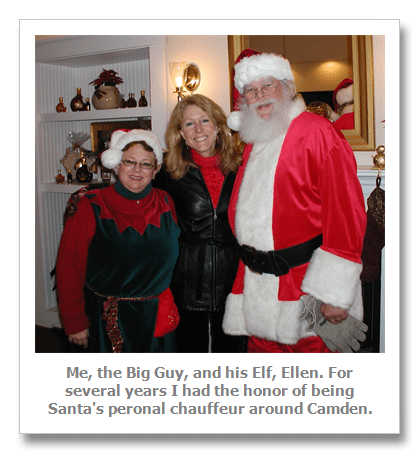 This entry was posted in Vicki's Posts and tagged Aldemere Farm, Camden, Christmas By the Sea, Christmas Festival, First Congregational Church of Camden, Santa, Vicki Doudera. Bookmark the permalink. Pictures look like there’s no snow. Haven’t you had any yet? When we visited the Camden area, one of my favorite things was seeing the Oreo Cookie Cows. Made me smile. Thanks for sharing your traditions. No snow yet, Marsha! 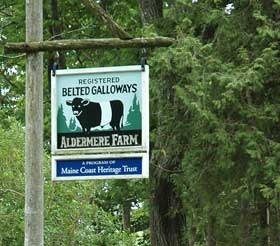 Yes, I love those cows… and we have several “Beltie” ornaments on our tree, made by my daughter at Aldemere farm. Oh, I wish I could be there! There’s nothing like a small town Christmas. Thanks for sharing this, and I hope it draws lots of folks to Camden. But where is the photo of the belted Galloway? They are so cute, especially the calves. ooooh, sorry Kate! I’ll try to get you one! Lovely, lovely post, and great photos. Many thanks, and Merry Christmas!